An extremely good turn for the first event of 2018, despite Bob’s warning that we had a full 6 miles in front of us. We parked at the Duke of Edinburgh in the hamlet of Woodside. It was a very windy morning but the rain stayed away. The going was heavy & soft in places to begin with but as we got round the course it improved good to soft & good. Not too many hurdles in our way. We covered bits of Ascot that we not normally see when driving past in our cars. 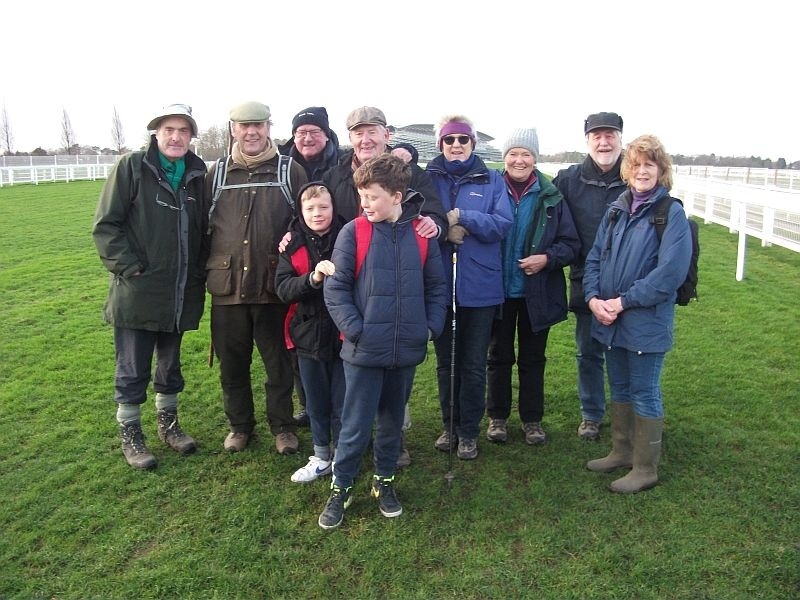 We took in Kiln Lane, Kennel Drive, Winkfield Road, New Road, Forest Road, the Drive of Mill Ride Golf Club, Kennel Avenue, Ascot racecourse, the straight mile course (the photos show the members of the Mile Straight Club). Then on to Great Pond , Paddock Wood & Wood End before returning to the D of E for lunch, where we were joined by Laurence. One definition of Ramble is to wander round in a leisurely, aimless manner. Leisurely maybe, but certainly not aimless with Bob in charge. The December walk has become a fixture on the calendar. A circular walk of 4.25 miles followed by lunch at Phyllis Court. Starting point is the car park at Mill End, Hambleden. The 300 yards walk over the weir. Greenlands Estate, the largest single area protected by National Trust covenants. Victorian Gothic Church of Remenham . On the north wall of the church is a memorial plaque to Lord Hunt who led the successful expedition to climb Mount Everest in 1953 and lived for many years in the parish.